As Christmas presents go, this one was a shocker:? Over lunch on Monday, cash-strapped Finance Minister Jim Flaherty promised provincial and territorial finance ministers he’d increase federal funding for health care by six per cent each year for the next five years. ?No strings attached. No negotiations.? A done deal.? With a catch. The provinces and territories have five years to figure out how to make health care sustainable on their own terms, every Premier for himself.? After that, the Harper Government will contribute less, tying federal contributions to the growth in the economy, with a floor of three per cent. That punts serious discussions about tackling growing health and regional disparities to the other side of the next federal election. ?And it maintains the Harper government’s “talk to the hand” stance on major changes in public policy which affect other jurisdictions, like the senseless census long-form debacle and the evidence-free crime and punishment agenda. Widely perceived as a 50-50 bargain, the federal share of provincial and territorial health care expenditures peaked at 55 per cent of what was spent on doctors and hospitals in 1977-78, including transfers in the form of tax points, a feature of the new Established Programs Financing form of federal support to the provinces.? (Quebec had been seeking federal support in the form of tax points rather than cash for decades.) 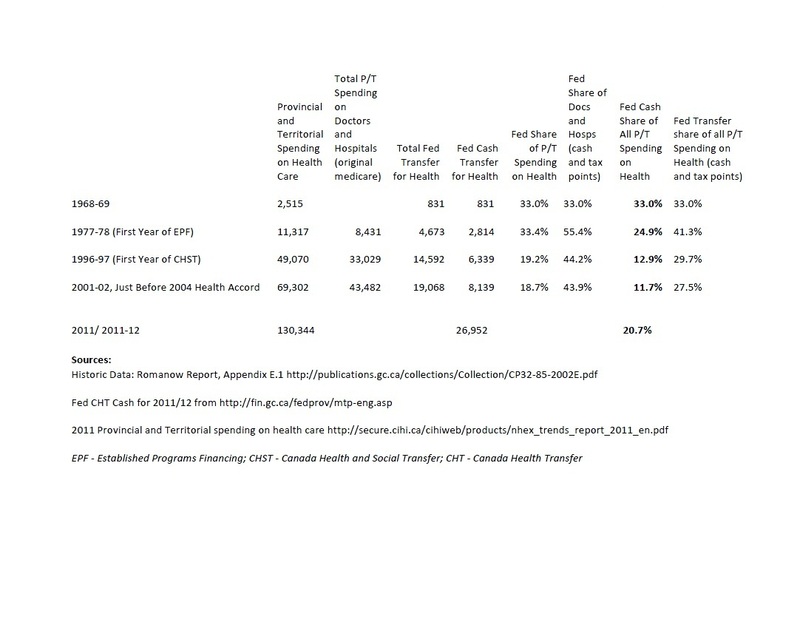 Federal cash only covered 25 per cent of what the provinces and territories spent on all health care that year. By 2001-2, when negotiations for the 10-year Health Accord started, federal cash contributions covered 12 per cent of all provincial and territorial spending.? It had fallen even lower during the Troubled Times of the late 1990s, triggering the slogan for those who wanted a strong role for the federal government in assuring roughly equivalent access to health services no matter where you live across the country.? That slogan was “no cash, no clout”.? ? ?It worked for most of the provinces too.? The deal, finally signed in 2004, guaranteed an increase in the federal cash contribution over time, with a promise that new money would buy change. Today the federal cash transfer for health covers 21 per cent of what the provinces and territories spend on public healthcare.? Across the provinces the federal share ranges from 12.6 per cent? (Alberta) to 23.8 per cent (Quebec). The Northwest Territories and Nunavut are both below 10 per cent, but there the feds pay directly for more public health care expenditures. It may seem generous to offer 6 per cent more a year when cuts are on the horizon for other programs, with public revenues and GDP ?growing slowly. If sustainability means bending the cost curve for health care, we need more than what Flaherty’s Done Deal offers.? I’m not talking more money. The $26 billion over five years could buy important reforms if it’s harnessed to that purpose; like our governments agreed to do in 2004. You never hear about that.? The attention is always on what isn’t working.? For sure, there is plenty of room for improvement; and Canadians want to see it.? And, as the 10 year 2004 Accord winds down, the question is: what is the most important thing for our governments to focus on improving right now? The Harper Team boiled down the meaning of the 2004 Health Accord to an automatic escalator. That misses the point.? The Accord has shown that focus and commonality of political will, with a long-term financial guarantee, can bring about positive and meaningful change. More money without a plan is just that, more money.? Canada’s most valued social program needs a plan.? A plan that tackles growing disparities in health outcomes and growing gaps in access to care.? A plan that brings our best minds together, working in concert, to bend the cost curve by focusing on improving health and improving care.? It’s possible, but it requires more than the blunt tool of cost control. It requires a shared strategy and focus on improvement.? A health “plan” without a plan is just a fancy way to say “devolution”.
? How Much Would Harper Cost Your Province?
? Liberal Words: Money Where Your Mouth Is?
? Green Words: Money Where Your Mouth Is? Actually it was my dissertation project which sparkled me to read about health issues and since then I have been following your articles. A plan without a plan is, I guess, is an easy way of covering corruption. I really want to thank Armine Yalnizyan for her inspiring researches.